Some scientists have warned that when it comes to running – from sprints to marathons – the era of breaking records may be coming to an end. The Olympic motto is “Faster, Higher, Stronger,” but what if we have reached the limits of the human body? Some scientists have warned that when it comes to running — from sprints to marathons — the era of breaking records may be coming to an end. That is, unless the next athletic evolution is artificial and it is doping, rather than human exertion, that breaches the next barriers. Only one world record was broken at this year’s athletics world championships in London, in the newly-recognized women’s 50km race walk. And at the 2016 Rio Olympics, just two running world records were bested — South Africa’s Wayde van Niekerk in the 400-meter men’s event and Ethiopia’s Almaz Ayana in the women’s 10,000m. After the great advances of the 20th century, “the rate of improvement is approaching zero for the majority of athletic trials,” said Marc Andy, a researcher at France’s Institute of Sport Biomedical Research and Epidemiology. In 2007, the institute analyzed the history of Olympic records since the modern Games began in 1896 and calculated that athletes have reached 99 percent of what is possible within the limits of natural human physiology. The most recent near breakthrough in the gruelling marathon occurred in May when Kenya’s Eliud Kipchoge came agonizingly close to sporting immortality, nearly running the first sub 2-hour marathon. He missed the mythical mark by just 25 seconds. 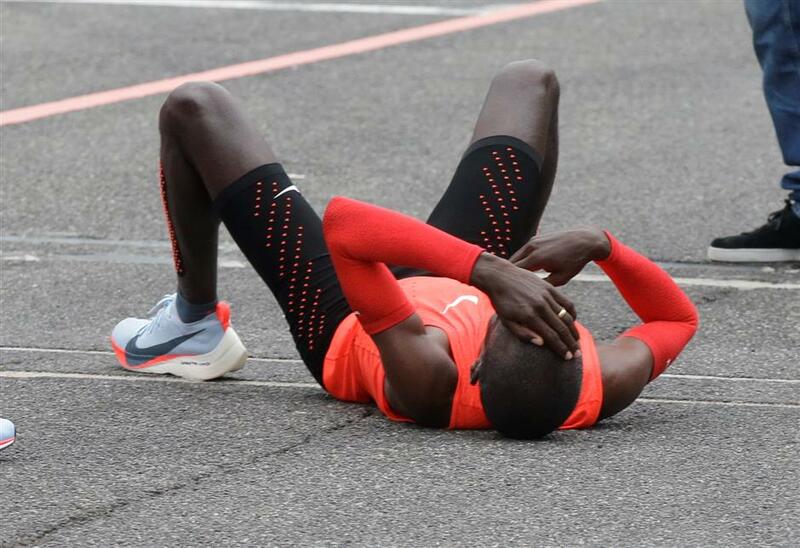 Olympic marathon champion Eliud Kipchoge lies down after crossing the finish line of a marathon in Italy on May 6. But the race conditions at the event were also favorable — Kipchoge ran behind a six-man pace-setting team and was trailed by a time-keeping vehicle on a racing circuit in Monza, Italy — that the time was not recognized by the International Association of Athletics Federations. Fellow Kenyan Dennis Kimetto remains the world record holder for his 2:02:57 run in 2014. Coaches and scientists have tried to figure out the optimal performance conditions for running the classic marathon distance of 42.195km. Beyond the ideal temperature — around 12 degrees Celsius — and the runner being small, “there are dozens of factors at play, from body type to physiological and biomechanical criteria,” said Pierre Sallet, a performance expert from Athletes for Transparency, an organization that promotes integrity in sport. “How are we going to identify these parameters in these categories? How will we manage nutrition and altitude training as well as maximizing form and energy to arrive on the day in the optimal psychological and physical condition?” Sallet asked. Beyond environment and body shape, “three major physiological parameters come into play in marathons,” Vincent Pialoux, deputy head of Lyon’s Inter-University Laboratory of Human Movement Biology, said. “Endurance, the ability to create energy using oxygen,” which is measured by a runner’s VO2 max (Maximum Oxygen Uptake Capacity), and “motor efficiency,” the body’s ability to save energy, Pialoux said. “Of these three factors, if we take the best data measured in the laboratory on different athletes, we arrive at times well below the limits predicted” by models based on the evolution of performance, he said. An athlete who combines all the optimal conditions has yet to be found. When Ethiopia’s Haile Gebrselassie broke his own world record in Berlin in 2008 he was 35 years old. But Pialoux said that VO2 Max decreases over time. Within all these very human constraints, could doping be the evolution the models did not predict? 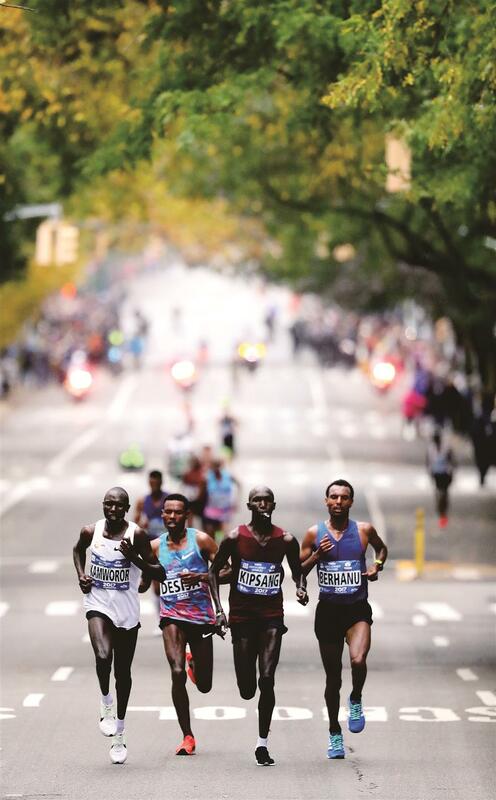 From left: Geoffrey Kamworor of Kenya, Lelisa Desisa of Ethiopia, Wilson Kipsang of Kenya and Lemi Berhanu of Ethiopia lead the field of the Professional Men’s Division during the 2017 TCS New York City Marathon. Should we fear the scenario imagined by Belgian philosopher Jean-Noel Missa, in which genetically enhanced athletes compete for corporations at the 2144 Brussels Olympics? It’s not time to panic yet, but Xavier Bigard, scientific advisor to the French Anti-Doping Agency, said there are several causes for concern, including exercise pills that could be used to “increase the effects of training,” and EPO doping, which increases oxygen absorption, allowing athletes to run harder and faster without tiring. While stem-cell therapy may sound futuristic, it has already been used in some sports to help heal injuries. It is genetic doping that seems to loom largest over the future of cheating in sports. Doctors have for years been experimenting with ways to inject synthetic genes into patients, altering an individual’s genome to enhance muscle recovery or stem muscle deterioration, among other benefits. These techniques could hypothetically give athletes a huge advantage. “The transformation of man into an animal capable of running a marathon in one hour and 40 minutes would take a long time, if it is possible, and there are an incalculable number of scientific limits,” said Sallet.